After hiking out of the Bugaboos and driving north to Golden, Chris and I wandered up and down it's side streets looking for a wifi connection to figure out where the sun was hiding. Both of us really wanted to spent some time in Roger's Pass to climb the iconic northwest ridge of Mount Sir Donald, but the weather forecast didn't look good enough. I'm not a fan of spending time hanging out in the high alpine in a whiteout, although some of my previous trip reports might suggest otherwise. The weather looked good enough at Lake Louise, only a few hours away to the east. So off we went, tired from the hike out of the Bugaboos, refuelled with vegetables and drove out of Golden to the nearest rest stop for a few hours of sleep underneath a lamppost with a "no overnight stay" sign. We woke up early the next morning (a common theme of the trip), and finished the rest of the drive into Alberta and into Lake Louise. We spent the morning vegetating at the hostel. Eventually I got restless and insisted that we try to climb a few routes at the Back of the Lake before the afternoon thunderstorms arrived. I think I was ten years old when I last visited this area with my parents on a summer road trip. Little did I know that mountains could be climbed and that an incredibly fun area of climbing was only a half an hour walk away. We weaved through the endless numbers of tourist enjoying the scenery of the lake and arrived at one of several quartzite cliffs at the far side of the lake. 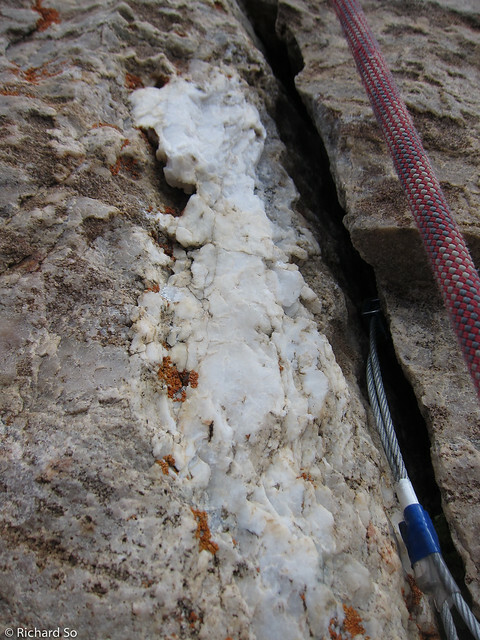 Unfortunately my tips were still crack and bleeding, limiting our choices for routes. 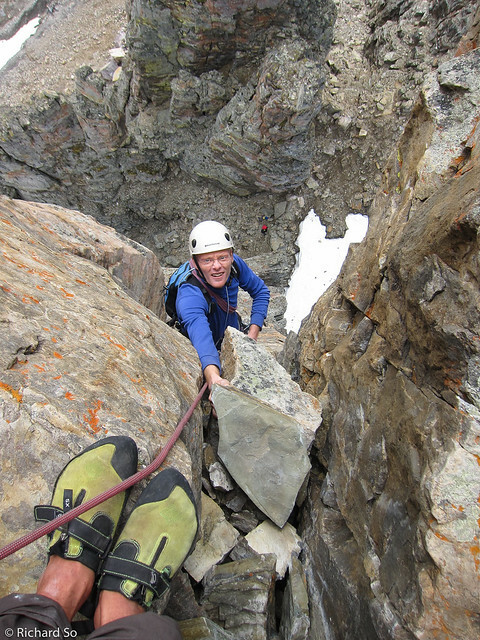 We climbed a few routes at Trailside and Blob Rock, on immaculate steep quartzite before retreating just in time as the afternoon thunderstorms arrived. A view down Lake Louise. We climbed at the crags back there. The east face of Mount Victoria looms above. Climber descending on the Air Voyage wall. 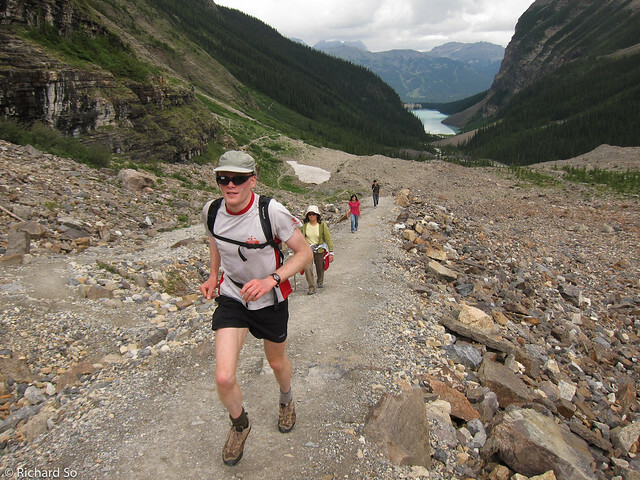 Aug 11, 2011 Chris running up the Plain of Six Glaciers trail. I could overhear some tourists wondering if Chris could carry them back to the Chateau. Note the white sticker on Chris's brand new sunglasses. Very stylish. 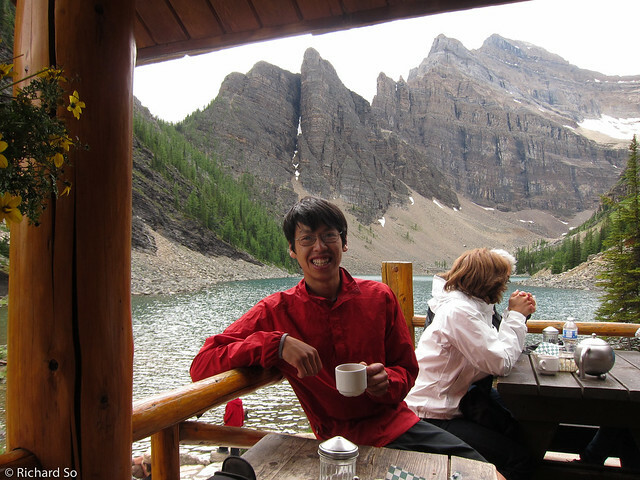 Completing the Rockies experience with afternoon tea at the Lake Anges Teahouse. 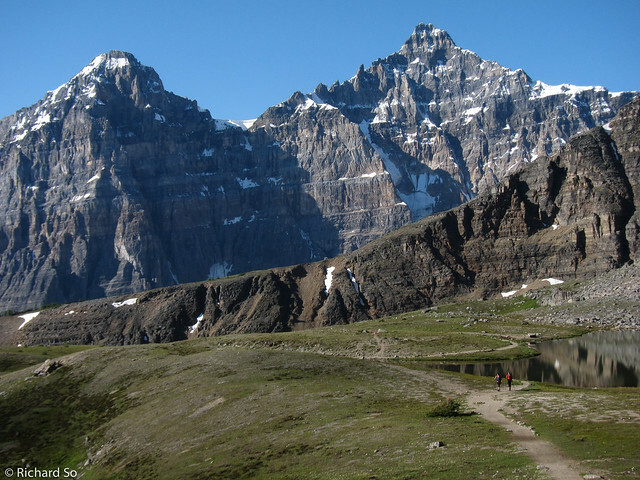 Mount Whyte is the peak in the background. 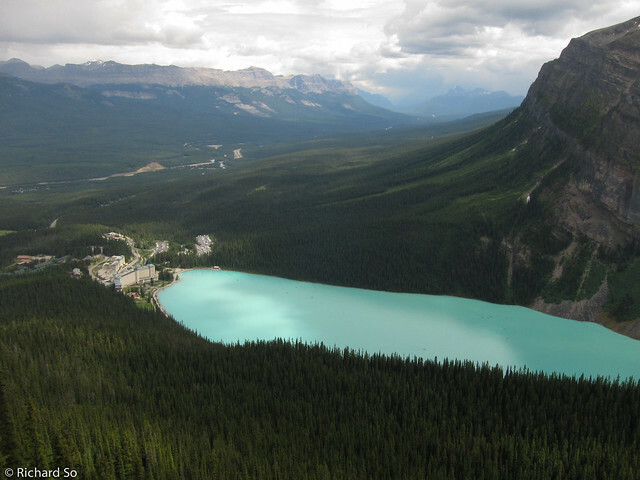 Looking back down at Lake Louise. A final sugar boost before finishing the run back to the hostel. Aug 12, 2011 Less than an hour into the approach. 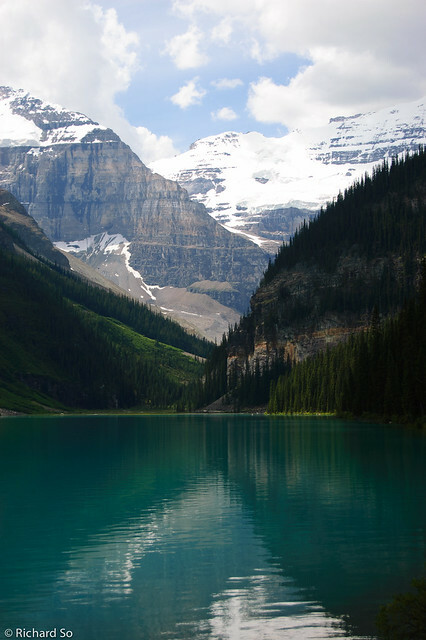 This is the Canadian Rockies. I could get used to this, if only the peaks weren't so grey and brown. 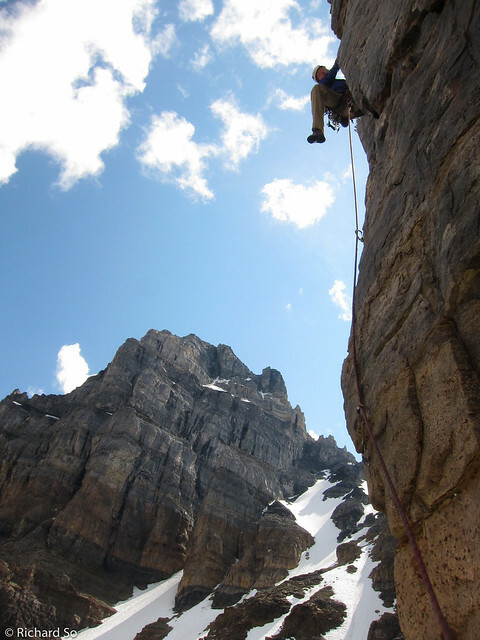 This trail is also the approach for the standard scrambling route up Mount Temple. Cardiac Arete and Mount Temple. There are a few other quartzite towers in the area too. A final view towards the Grand Sentinel. I hope it doesn't fall over anytime soon. 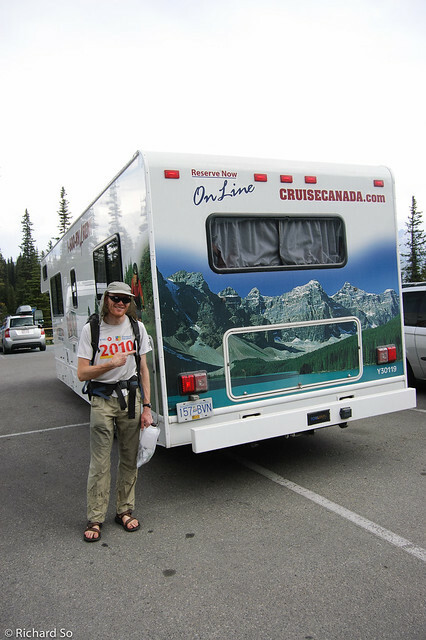 One of many RV's in the Lake Louise parking lot. We visited the lake pictured on this RV the next day. If it weren't for all the other cars here, this guy could have taken up six parking spots instead. In order to save the remaining skin on our finger tips for our climb up the Grand Sentinel on the next day, Chris and I spent our rest day by running a scenic loop to the two teahouses above Lake Louise. A map of the route can be found here. 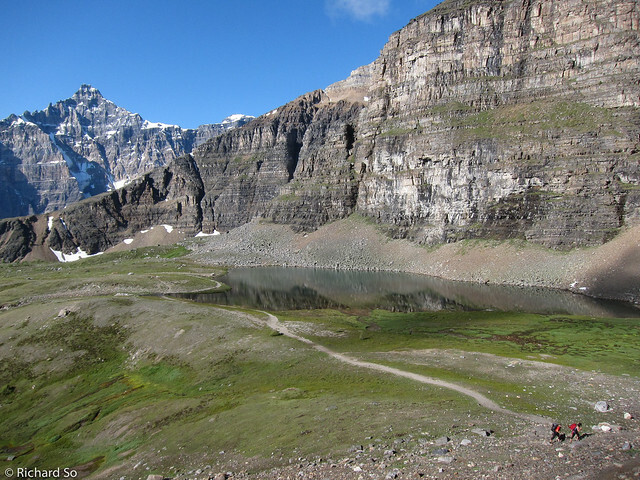 We started at Lake Louise, ran along the shore of the lake, up to the Plain of the Six Glacier teahouse, along the Highline trail over to the Big Beehive, down to the Lake Anges Teahouse, over to the small Beehive, back down to the Chateau and I continued out along Lake Louise creek back to the village. A highly scenic loop. I'd recommend starting early in the morning to avoid the endless crowds. I'm glad I finally visited this area and stared at the mountains around here, as it seems like the majority of the ACMG mountain conditions report are from this area. 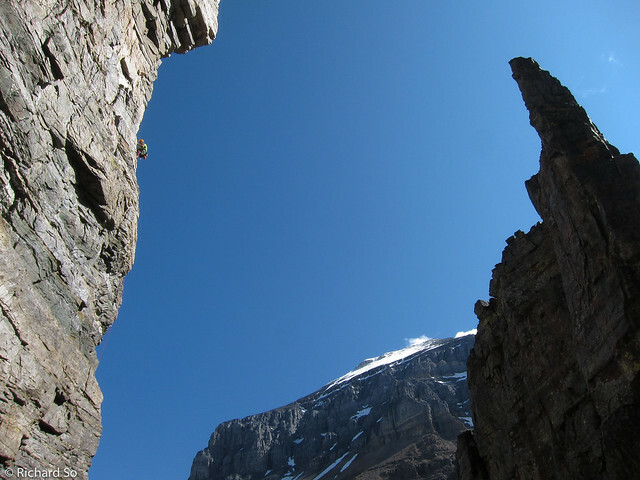 The peaks around Lake Louise seem very popular. 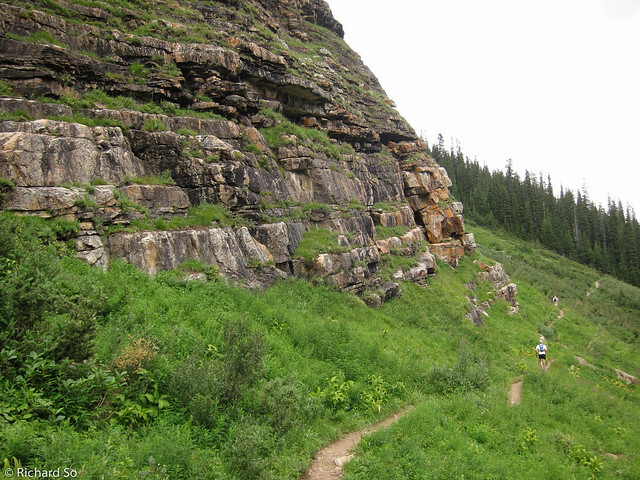 Running along the Highline trail over to Lake Anges. 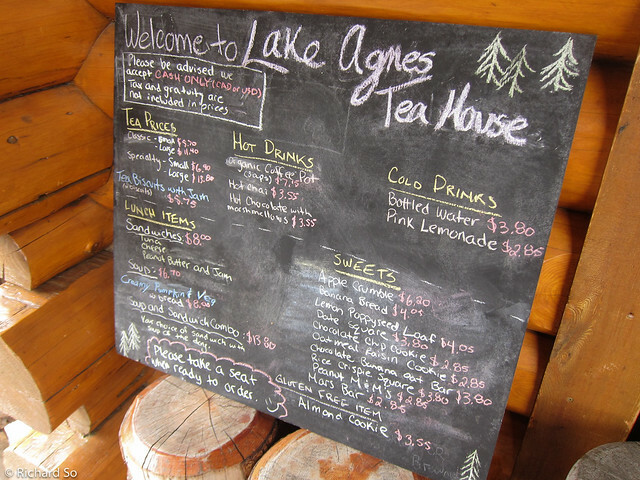 The menu at the Lake Anges Teahouse. 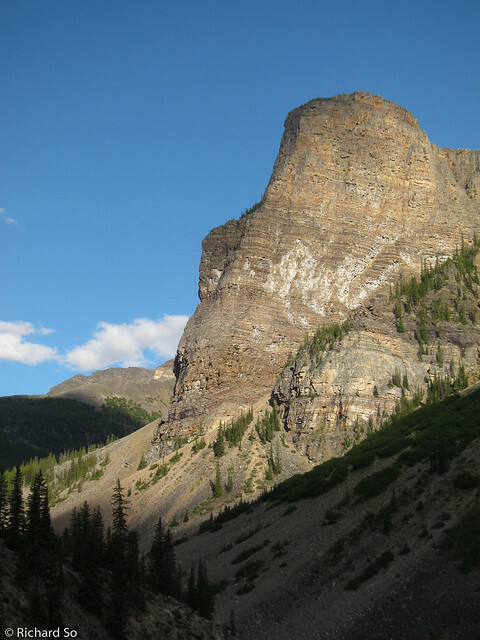 We capped off our short stay in Lake Louise with a great day of climbing on the Grand Sentinel, a spectacular quartzite tower in the shadow of Mount Temple. We climbed both the Standard Route, 5.9, on the south face and the fully bolted Cardiac Arete, 5.10d on the southeast arete. 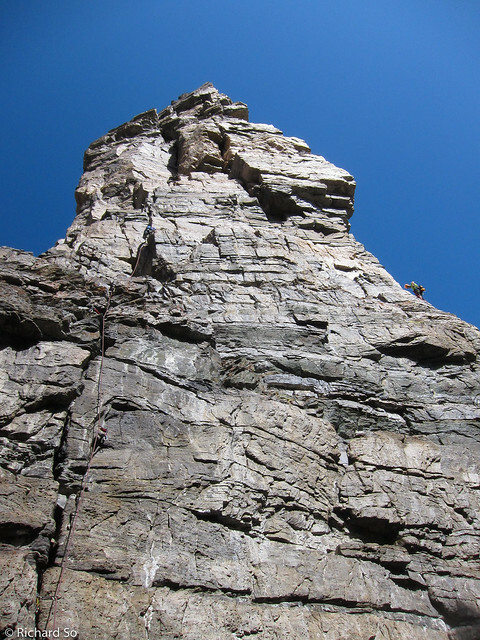 Both routes were great, although the rock and climbing is far superior on Cardiac Arete. Even the approach was fantastic! 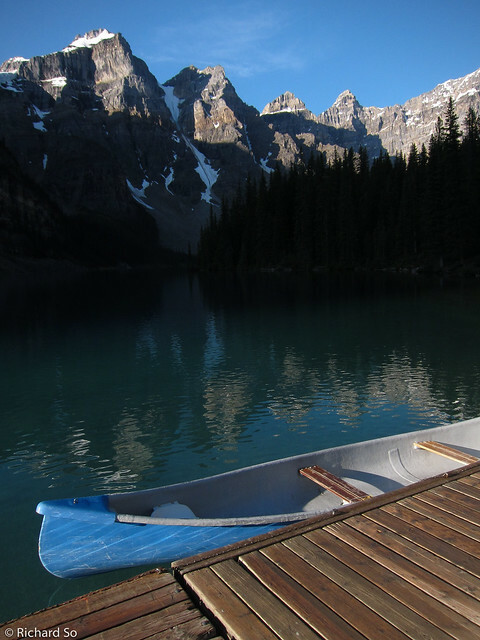 Morning light on Moraine Lake, a famous lake in the Canadian Rockies. 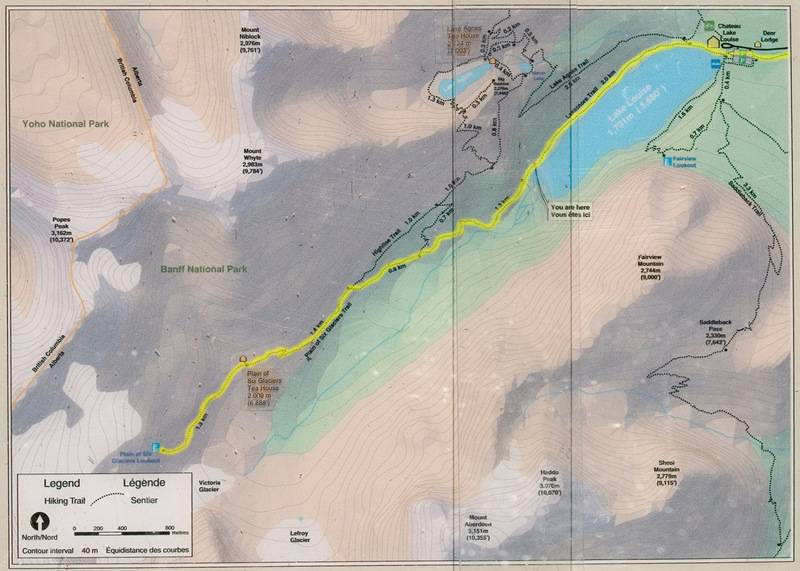 The approach takes two to two and half hours up a perfect trail through Larch Valley and up into Sentinel Pass. 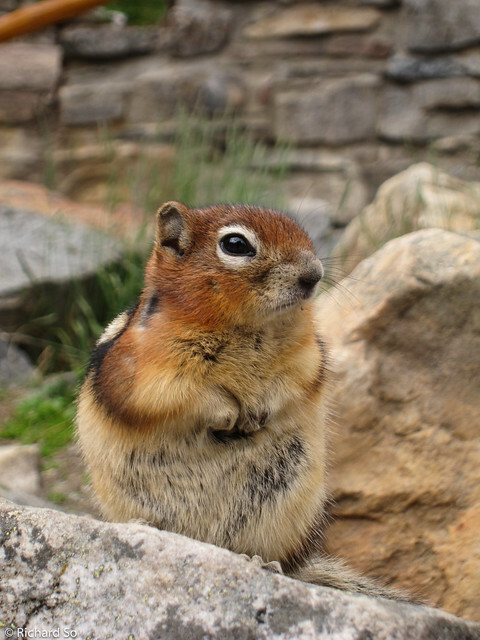 Parks Canada enforces grizzly bear restrictions on this trail, requiring a minimum party size of four. We waited around until two other hikers joined us for the hike up. 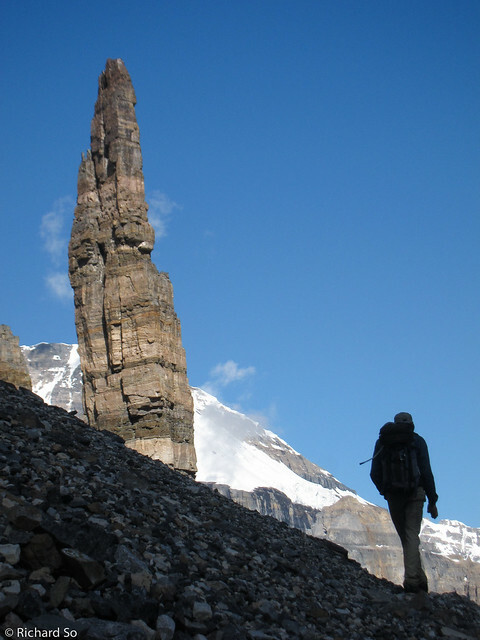 From Sentinel Pass, we dropped down into the opposite side towards Paradise Valley and crossed scree slopes to the base of this 90m quartzite tower. I suspect an iceaxe could be useful earlier in the season, but we were fine without. The rock is very interesting on the tower, as it 's not composed entirely of quartzite, with a few contacts with slate in between. Chris at the base of the Standard Route. 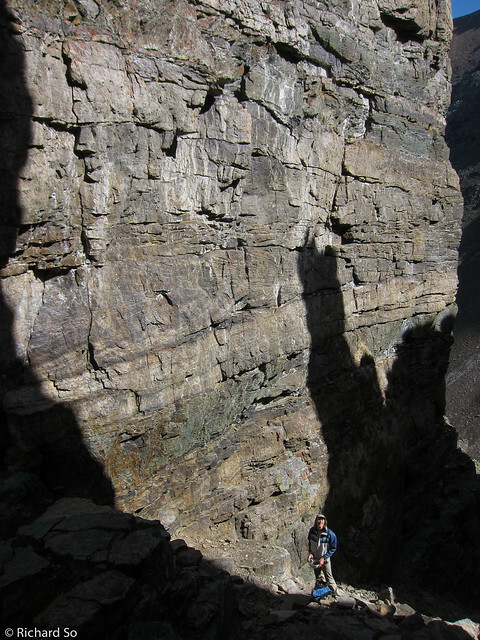 To get onto Cardiac Arete, there is a small ledge to walk on in the shadow. Chris leading up Pitch 1 and 2 of the Standard Route. 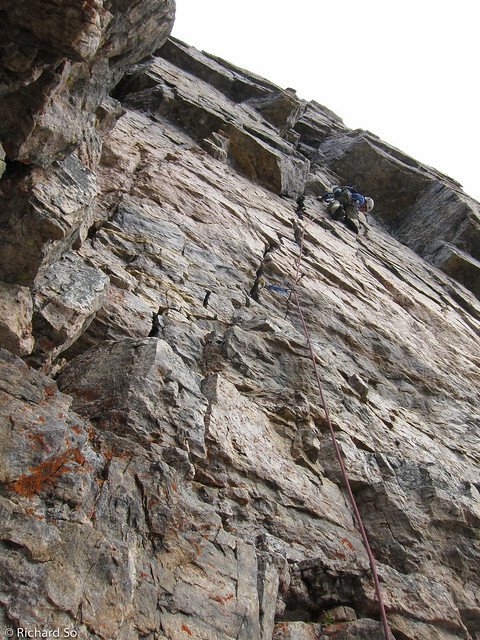 The climber on the right is on Cardiac Arete. 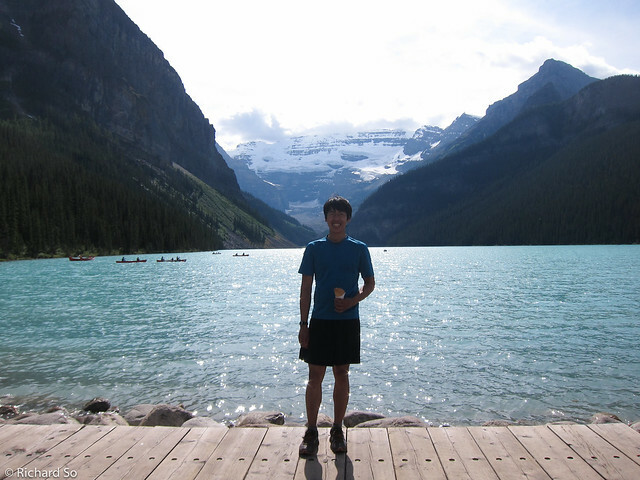 Earlier in the morning, he finished his night shift at the CN rail yard in Golden, was picked up by his friend and drove out to Lake Louise. They also climbed both routes on the tower and he was planning to work another night shift after the climb. The geology was fascinating and distracted me from the actual climbing. 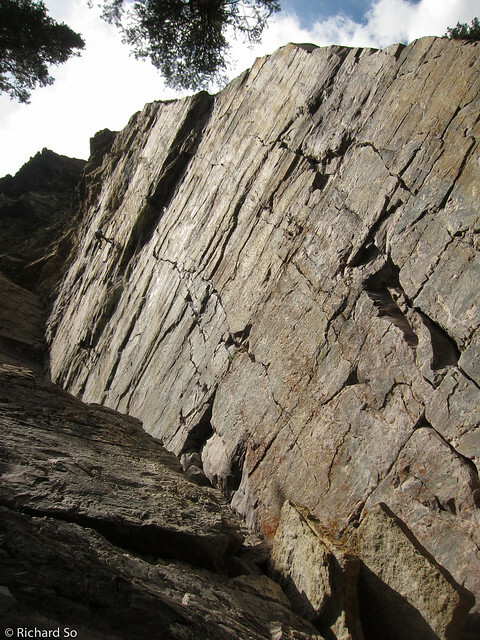 The best part is when you transition from quartzite to slate and back to quartzite, all within a few metres. 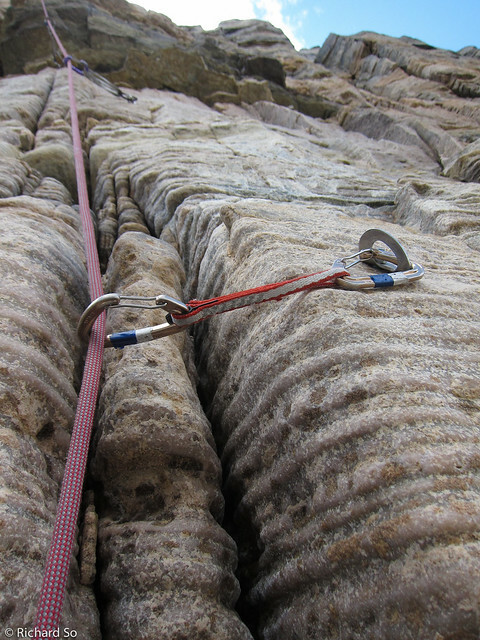 Pitch 3 is the best pitch of the Standard Route, which follows a wide corner crack and finishes off over a roof. Of course, loose blocks were waiting at the top. I wouldn't recommend climbing underneath another party on this route. Chris leading up Pitch 4 towards the summit. 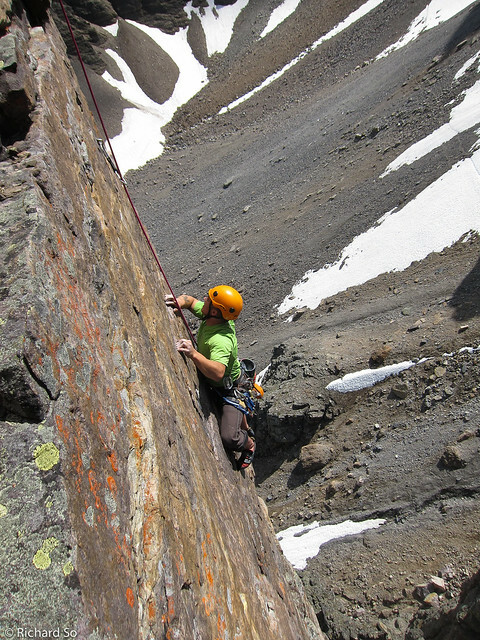 Looking over at the last pitch of Cardiac Arete, some fun face moves. 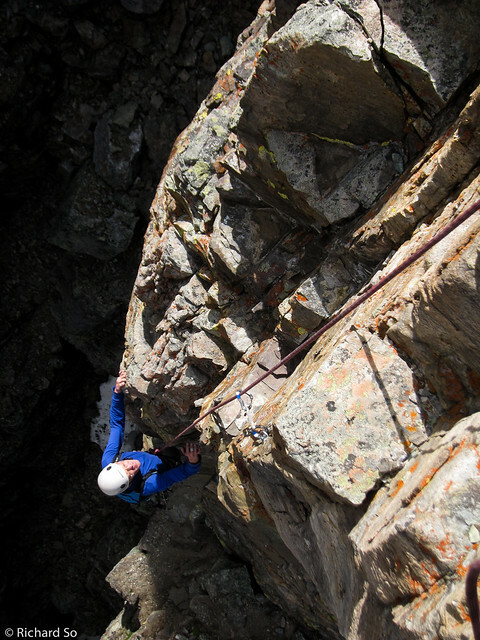 It's possible to rappel off either the Standard Route or Cardiac Arete. Be prepared for free-hanging rappels on the latter. An unsettling view across to the other side of the Grand Sentinel. Chris following the first pitch of Cardiac Arete. 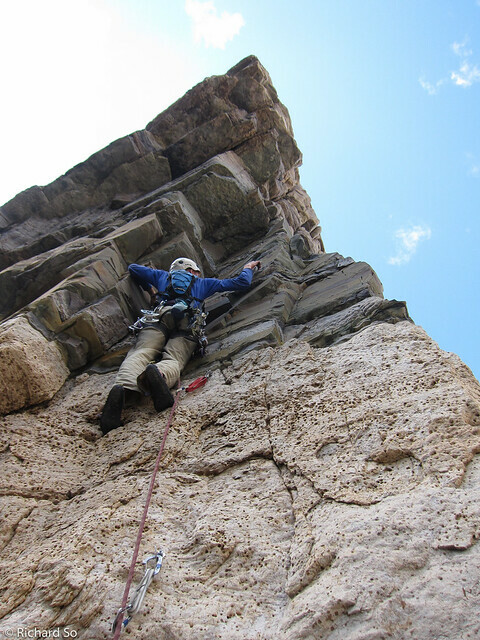 I love multipitch sport climbing, it's such a great way to move quickly. 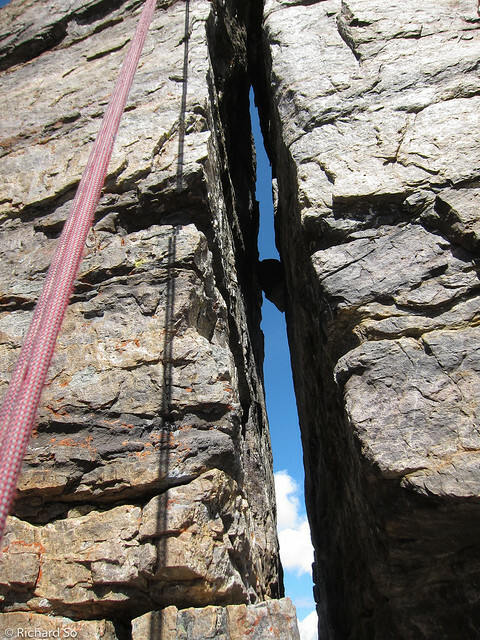 I think Cardiac Arete might be amongst my top five favourite sport multipitch route. Chris leading up Pitch 2. The only gear required on the route is twelve quickdraws. A #4 camalot is not necessary for either route, but it's a good habit to carry around unnecessary gear. Weathered quartzite cracks and runnels. Chris pulling a move on Pitch 4. Steep crimpy moves at the crux. There was occasional rockfall off the snow slopes which rolled onto the approach. 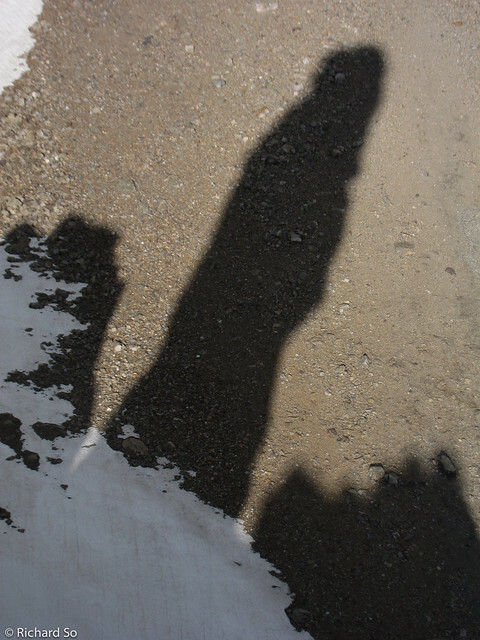 The shadow of the Grand Sentinel. 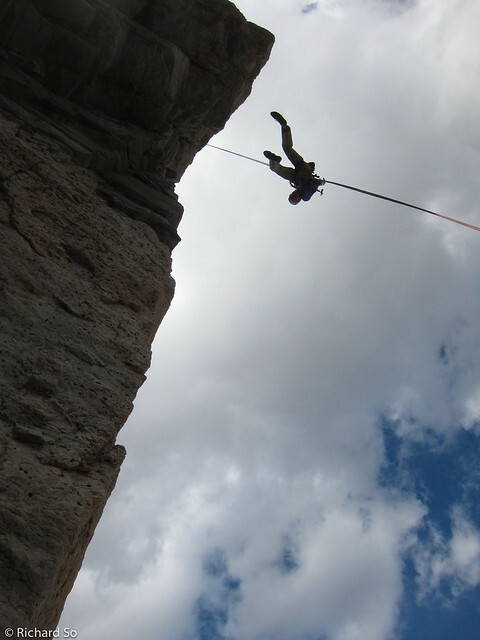 Four free-hanging rappels with our 60m rope brought us back to ground. Don't forget your knots and prussiks for this one. The last rappel is a full 30m tail snapping rappel. 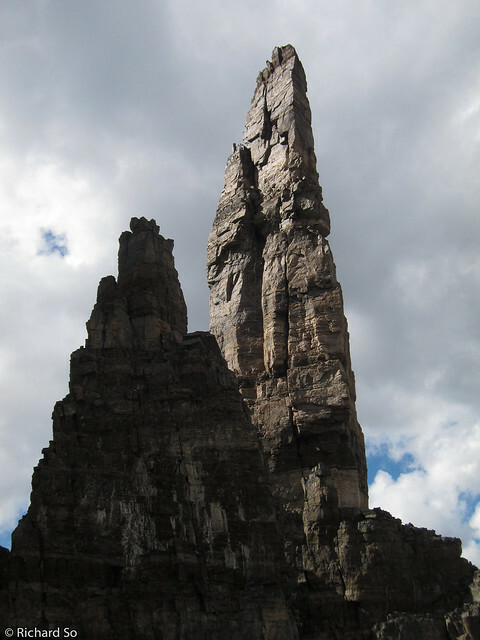 The Tower of Babel, another quartzite tower which offers up to seven pitches of 5.8 climbing. 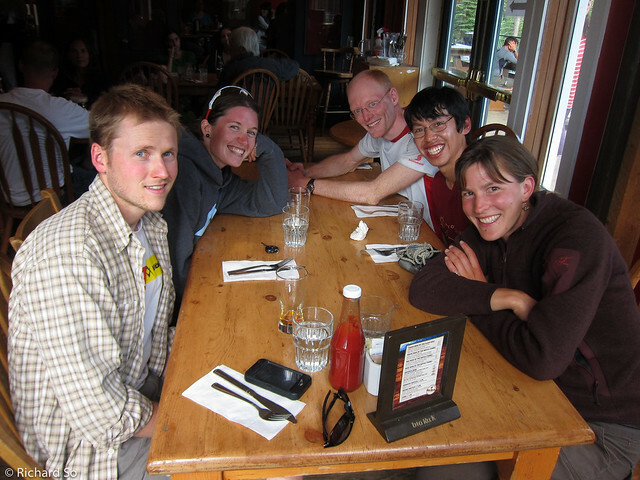 By coincidence, we met Jeff Charlie and Natalie at the hostel who had just finished a long trail run from Castle Junction to Healey Creek in Banff National Park. A great way to finish off the day!